Julep Beauty Coupon Code for 30% Off! Right now Julep is offering a Julep beauty coupon code to Save 30% at Julep.com! When you check out just use the coupon code DEC30. Offer expires on 12/31/15 at 11:59pm PT. Promotional code DEC30 must be entered at checkout. Offer may not be combined with any other promotional code and is limited to two uses per customer. Orders placed for the Monthly Maven Reveal (e.g. monthly Maven Boxes, Upgrade Boxes, and add-ons) are not eligible. Offer applies to julep.com purchases, excluding Mystery Boxes and products in the Jule Box, Savvy Deals, Sweet Steals, and Weddings catalogs. Not valid for purchase of julep.com gift cards, gift boxes, or Gift of Maven. No adjustments on previous purchases. Taxes vary by location. 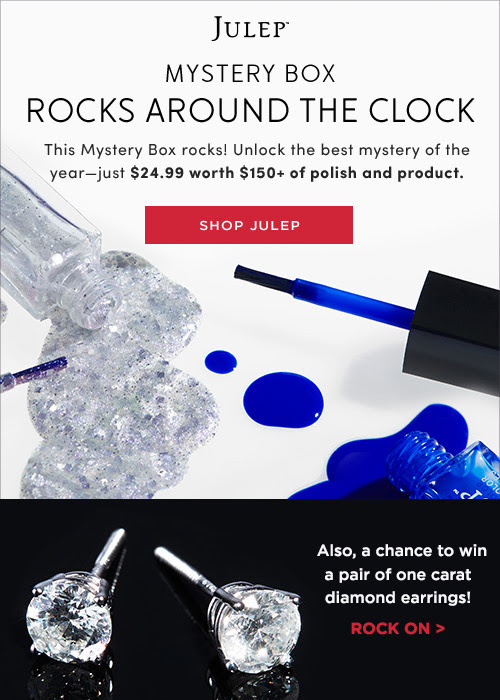 Julep Rocks Around the Clock Mystery Box just $24.99 ($150+ value) + win a pair of diamond earrings! Turn up the sparkle with the Rock Around the Clock Mystery Box, featuring two new colors: Carmen (Boho Glam) and Layla (It Girl). The box is just $24.99 but is filled with over $150+ of polish and beauty products. Also, you have a chance to win a pair of one diamond earrings! Julep will select one lucky Mystery Box customer to win a pair of one carat diamond earrings (which are shipped separately). Details: Offer expires on 12/19/2015 at 11:59PM PT, or while supplies last. Every Rocks Around the Clock Mystery Box will include Carmen (Boho Glam) and Layla (It Girl). Other products vary. Purchase of multiple Rocks Around the Clock Mystery Boxes may result in polish or product overlap. Offer may not be combined with any other promotional offer or discount (e.g Maven 20% discount). No exchanges or returns are possible on Mystery Box or individual items. Estimated full retail value is at least $150. Taxes vary by location.